After rejecting ferry service for more than a year, Gov. Charlie Baker has reversed course and will fund a weekday excursion from the city’s terminal to Boston’s Long Wharf. The boat is expected to launch on Tuesday, June 20, and run until Friday, Sept. 22. It will consist of one departure from the Blossom Street Extension at 7:45 a.m., arriving in Long Wharf at 8:20 a.m., and one evening return from Boston at 6 p.m., arriving in Lynn at 6:35 p.m. The cost for the 35-minute trip is $7 each way, $3.50 for children and seniors. Limited ferry service to and from Boston is returning. 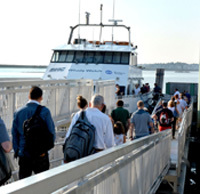 “We are pleased to provide the needed additional resources for Lynn to once again offer this seasonal ferry service, which will give residents and visitors yet another transportation option,” said State Transportation Secretary Stephanie Pollack, in a statement. This represents a change in direction for the Baker administration and the Massachusetts Department of Transportation (MassDOT). On Thursday, a spokeswoman for Pollack said the state is providing a Highway Division grant of up to $200,000 for ferry service this summer to mitigate the impact of Route 1A and Sumner Tunnel construction projects. “We don’t expect the city will need all of the $200,000 since the ferry generates fares,” said Jacquelyn Goddard. But in 2016 the Baker administration halted service and blamed the city for failure to come up with the $700,000 in operating expenses needed to operate the ferry. That disagreement appears to be over for now. State Sen. Thomas McGee (D-Lynn), who has been a champion of the ferry and criticized Baker for failing to fund it last summer, praised Pollack for her leadership. James Cowdell, executive director of the Economic Development and Industrial Corp., the city’s development bank said he’s excited that the ferry is back. “The two year pilot program proved that there is a demand on the North Shore for a commuter ferry out of Lynn,” he said in a statement. Last spring, in an effort led by U.S. Rep. Seth Moulton (D-Mass.) and in partnership with state and local leaders, the Federal Transit Administration awarded a $4.5 million dollar grant for Lynn to purchase a vessel to support ferry service. “The ferry will provide access to higher-paying jobs, housing, and opportunity for Lynn,”Moulton said in a statement. Additionally, MassDOT provided technical assistance resources last winter for the city to develop a long term sustainability plan for ferry operations, and is currently assisting with the purchase of the boat. Mayor Judith Flanagan Kennedy could not be reached for comment.